Sweden, Finland and Norway have world-class opportunities for hiking, from the dramatic mountain landscapes of Lapland in northern Sweden and Jotunheimen in central Norway to the deep, quiet forests of Kainuu in Eastern Finland. Nature Travels offers a wide range of possibilities for hiking holidays. Which tour is most suitable for you will depend on the kind of experience you are looking for - whether you would like a guided or self-guided hiking tour, prefer accommodation in cabins along the route or the adventure of wild camping. Note that the Self-guided Hiking on the King's Trail tour follows a very similar itinerary to the guided King's Trail tour. Lapland, in the far north of Sweden, has some of the world's most stunning mountain scenery. We offer three guided experiences in this region: Discover Mountain Hiking on the King's Trail, Hiking on the King's Trail from Abisko to Kebnekaise and Hiking in the National Parks of Lapland. Discover Mountain Hiking on the King's Trail, Hiking on the King's Trail from Abisko to Kebnekaise and Hiking in the National Parks of Laponia all follow sections of some of Sweden's best-known long-distance hiking paths. 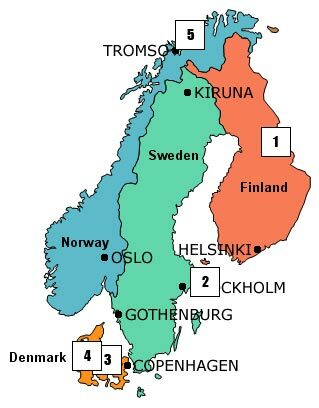 The King's Trail tour includes the option to ascend Sweden's highest mountain, Mt. Kebnekaise at 2101m. Accommodation is in mountain stations and in simple but comfortable mountain cabins along the route. Kainuu in Eastern Finland is the setting for our Hiking in the Finnish-Russian Borderland tour, taking in a beautiful, tranquil landscape of forest, moorland and lakes with the added benefits of luggage transfers between overnight stops (meaning you can walk with just a daypack during the day!) and a chance to add evening bear-watching excursion where, with luck, you can encounter one of the Nordic region's most iconic and majestic animals, the brown bear. For those seeking dramatic mountain scenery and challenging hiking but with the convenience of luggage transfer between overnights, Hiking Besseggen and the Jotunheimen National Park is a very good choice. From the steep stony paths of the Besseggen Ridge to the wide Svartdalen valley, this is a beautiful and varied landscape for a week's hiking. As a bonus, staying at the simple but comfortable cabins along the route and learning something of the area's history are both real features of the tour. And if you're still feeling the urge to touch the skies, you can add a day hike to a nearby glacier summit! The mountains of Lapland in the far north of Sweden and the forests, lakes and archipelago regions further south are the settings for our self-guided hiking tours. Self-guided Hiking on the King's Trail from Abisko to Kebnekaise is the self-guided version of the guided King's Trail tour and is offered at the beginning and end of the hiking season (only the guided option is offered during the main hiking season in July and August). A moderately challenging hiking tour with accommodation in simple cabins along the route, suitable for those with some previous experience of walking with a pack but still accessible to a wide range of adult particpants. Option to climb Sweden's highest mountain, Kebnekaise, is available as an optional extra (though note that ascents are not possible at the very beginning and end of the hiking season). The beautiful network of islands that make up the Stockholm Archipelago is also perfect for exploring on foot, with convenient boat connections between the islands. Island Hopping and Hiking in the Stockholm Archipelago is an accessible hiking tour suitable for both adults and families, with overnight stops in local hostels and guest houses along the way. 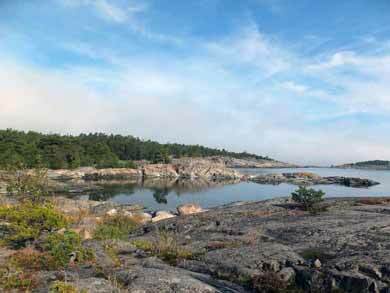 Sweden's West Coast archipelago in the area of Bohuslän also offers wonderful hiking. Self-guided Hiking on the Bohuslän Coast is a 2-3 tour where you can choose either a wild camping option where you choose your own camping spot each night (equipment provided) or to stay in comfortable hotels with some meals included. This tour makes a very good combination with any of our kayak tours in the area, or can be chosen as a stand-alone hiking holiday. While walking is a popular activity for almost everyone to some degree, a dedicated hiking holiday may not be to your taste. Nature Travels offers a wide range of opportunities for shorter and less challenging walks. For example, our choice of log cabins, bushcraft cabins, tree houses and yurts are all located in areas ideal for day walks. Challenging trek or romantic stroll in the woods - Sweden and Finland offer all kinds of walking, and Nature Travels offers hiking holidays to suit all kinds of walker!